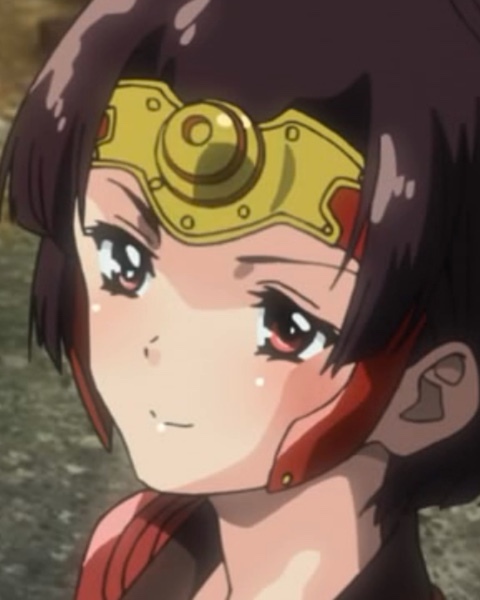 In Never-ending Darkness, the second episode of Kabaneri of the Iron Fortress, Ikoma finds out just how brave normal humans are (which is to say, not very). Mumei proves she’s dangerous with more than just the blade in her geta. The train’s “B Team” comes through! Caution! This review likely contains spoilers, not only for Kabaneri of the Iron Fortress, but of Attack on Titan as well. Ikoma and Takumi celebrate the success of the weapon they developed. Capture from the Amazon stream. Takumi finds a Ikoma just as the latter regained consciousness and was celebrating his victory over a Kabane that had attacked him. Takumi’s elated that their work on the piercing gun paid off. He’s taken aback, though, when Ikoma says he was bitten, but that he’s okay. Mumei, fresh from killing the Kabane at the end of last episode, arrives at the survivor’s staging area under Ayame’s command. The bushi are fighting to hold the Kabane back. In their fear, the nobles are beginning to challenge Ayame’s decision to wait for her father (who went to confirm the Koutetsujou was still safe). 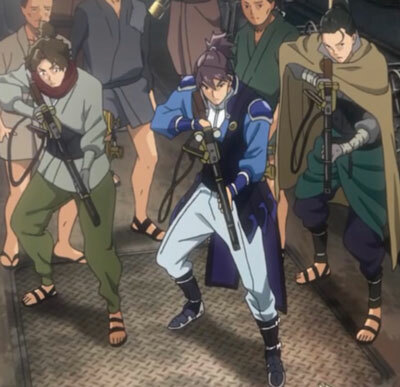 Mumei arrives, dressed very differently than she was before, now with a metal headband and wrappings around her legs and a bushi-like rifle strapped to her back. She tells the nobles to stand down. One of them tries to push her aside, and a second later, she slammed him, writhing in pain, to the ground. Telling the train’s engineer (a trainee named Yukina) to get ready, Mumei tells Ayame to wait until she clears a path. She then proceeded to leap over the wall. After double-checking her gear, she sliced off a Kabane’s head and threw it into the air to get all of them good and mad at her. Then she sprinted towards the Koutetsujou. Her Kabane hunt was professional Parkour in action. She ran up walls, flipped, and shot the Kabane while she was still in the air. She lured them into narrow alleys and destroyed their caged hearts. When she finally reached her goal, her only real emotion seemed to be regret that her escapade took 10 seconds longer than she anticipated. 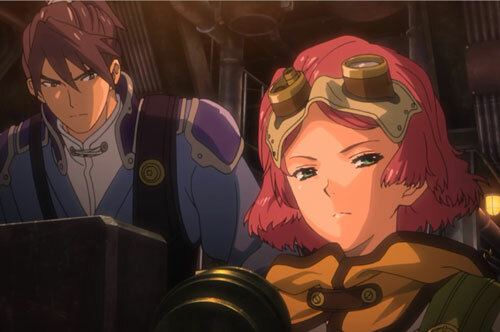 Ayame and Kurusu, the leader of her bushi forces, head for the train. Ikoma and Takumi arrive at the train. Takumi’s come to terms with his feelings about Ikoma having been bitten, but he knows no one else will accept it, so he throws a cloak around Ikoma’s shoulders. Two guards try to force them to prove they haven’t been bitten before allowing them on the train. They’re spared that confrontation when two Kabane arrive. Ikoma’s convinced that if he kills the Kabane in front of everyone, the crowd will have to accept him. A sleepy Mumei doesn’t give him a chance, though, as she nonchalantly kills the Kabane on her way to the Koutetsujou. Ikoma recognized her as the girl who talked to him while he was imprisoned. She notices immediately that he’s different; she even tells him that’s he’s not normal. Mumei knew right away that there was something different about Ikoma. Capture from the Amazon stream. Ayame and her horde arrive and begin boarding. Recognizing Ikoma, Kurusu tries to arrest him, but Mumei waves the bushi off and confirms Ikoma’s not a Kabane. Ikoma and Takumi board near he back so Ikoma can recharge his gun. Mumei goes to the control room where she finds a corner, covers herself with her cloak, and goes to sleep. The veins on her face glow orange-yellow. As Yukina prepares to leave the station, another wave of Kabane attack. Ayame’s reluctant to give the order to leave because they haven’t found her father. That problem sorts itself out when Kurusu sees the Kabane version of her father in front of them. She orders the Koutetsujou to leave. As he’s walking through one of the compartments, Ikoma sees a steam pipe break away. Just before it crushes his steam-smith friend Kajika, he stops it with his bear hands and reattaches it as if it were nothing. Takumi doesn’t know what to think when even getting near the pipe burns his skin. A Kabane tries to break in through a wrenched door as Ikoma charges his gun. Eager to show his guns’s capabilities to everyone in the cabin, he attacks the Kabane and kills it. He turns to tell the crowd they’re safe, but all they can see is the heart glowing orange under his cloak. He can’t understand it; Ikoma was certain he had stopped the virus, yet his body had clearly changed. He’s still trying to make sense of it when Kurusu blows him out of the train. The Koutetsujou arrives at a drawbridge leading out of town, but the switch won’t work. They can’t lower the drawbridge; they’re trapped. Kabane swarm the stopped train and some of them damage the water supply. Kurusu prepares to exit to manually activate the bridge. Ikoma arrives. Covered in blood, staggering, using his gun to kill the Kabane that leap on him, he challenges everyone in the train to watch him — to watch the one they expelled from the train spill his own blood to save them. He falls on the lever and lowers the bridge. The train begins to depart. Finally overcome by despair, he weeps as the train pulls away. Takumi tries to throw him a line despite two other men trying to stop him, but Ikoma ignores it. Mumei leaps to the ground, tied the line to his belt, and told Takumi to hoist him in. In a scene reminiscent of the opening scene, Kurusu throws a suicide package at Ikoma and orders him to use it. In an exasperated voice, Mumei says again that no, he’s not a Kabane. She lowers her jacket to show everyone that her heart, too, is glowing orange-yellow. “We are Kabaneri,” she says. 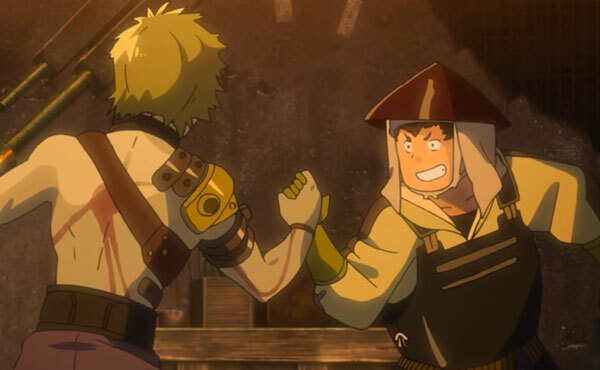 Ikoma and Takumi shared a bro-fist moment when they realized that the theories they’d been working on proved true! They seemed elated amid all of the destruction. Hope’s an amazing thing. Takumi could have bolted as soon as Ikoma confessed he’d been bitten. But, he showed his courage and stood beside his friend. How cool is that? Kabane react with rage when they witness one of their own killed. Capture from the Amazon stream. We saw more evidence that the Kabane have awareness and emotions. They certainly recognized when Mumei decapitated one of their own, and they reacted with fury when she threw its head into the air. Kabane aren’t the zombies from High School of the Dead; they are more intelligent, they’re more powerful, and they’re much harder to kill. Mumei might earn “Badass of the Season” award this season. She certainly got points for leaping over the wall, then calmly checking her gear — even licking her finger to check the wind direction — as she prepared to take on a Kabane horde by herself! She might as well have been playing tag as she destroyed the Kabane for lack of concern she showed. The music during Mumei’s Parkour performance felt appropriate; perhaps a little too modern bordering on anachronistic, but it worked for me. I had a strong feeling of sadness for Ikoma as he tried to show off the weapon he was so proud of. He thought people would accept him if he proved his worth; he didn’t understand that their fear and ignorance were way more powerful drivers. Even up until Kurusu blasted him off the train, Ikoma was convinced that he would be celebrated a hero. It’s hard to see someone’s dream be murdered right in front of me! Especially someone try to do something so objectively right. The train animation continues to be interesting and detailed. Heck, overall, the animation’s a lot of fun to watch. There are moments where the characters seem to go off model, but given how much I’m enjoying the show, I can live with that. Yukina wasn’t about to take any nonsense from Kurusu. Capture from the Amazon stream. Kurusu might be a high up in Ayame’s hierarchy, but when he tried to bully Yukina, she calmly fell back onto her experience and calmly explained why he should shut up and let her do her job. I like anime with interesting and authentic character moments; this was a great example. Poor, frightened humans: they’ll put you in the grave if you’re different enough. Even after Ikoma’s heart clearly glowed with a Kabane-like light, and even though Takumi was clearly terrified, he didn’t want to let the bushi kill Ikoma. He was able to balance his fear against his friendship, and the friendship won. Again, hope glimmers in this hellish darkness. Ikoma, literally cast out from the train, bleeding from dozens of wounds, fighting off Kabane with almost every step, won’t back down from his determination to save the people in the train. To save the very people who willingly and enthusiastically condemned him. He was becoming aware that he was apart from them, his nature something beyond human and yet not Kabane, and he thought he was utterly alone. Yet he still tried to save them. If that’s not the most noble moment I’ve ever seen in anime, I don’t know what is. What must he have been thinking as he watched the train leave him? Convinced that he was going to die, alone, among the Kabane, what must have been going though his mind? Then, crushed by despair as the train pulled away, he wept. That scene of him watching the train leave was pure artistry. The ED, Aimer with chelly (EGOIST) 『ninelie』, rocks. Kurusu and the bushi under his command were nothing if not consistent. Capture from the Amazon stream. After he got kicked off the train, I didn’t see Ikoma’s glasses; it looked like they’d been knocked off. He helps the train escape, and we see Mumei and his friend Takumi rescue him. After that, he has his glasses! Magic? Hidden pocket? Continuity issue? After the third time watching this episode, I saw that Takumi put the glasses back. But where did he find them? Does he carry a spare for Ikoma? This episode seemed to fly by. The writer, Ichirō Ōkouchi, and the director, Tetsurō Araki, are experts at pacing. They’re really good with character development, too. I know a lot of reviews compare this series to Attack on Titan, and there are enough similarities that I think such a comparison is valid. However, what strikes me more than their similarities is a significant difference: we find out in episode 2 that Ikoma is a Kabaneri. His isolation from other human begins very early in the series, and he’s conscious of all that entails. Eren Yaeger from Attack on Titan doesn’t find out he can become a Titan until the eighth episode or so (depending on how you count it). 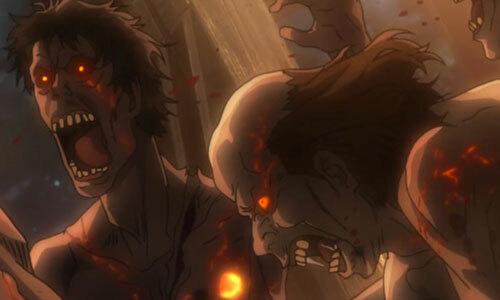 Even after becoming a Titan, he can’t remember the experience, so he still perceives himself as human. He has to deal with the prejudice from others, but he’s unchanged in himself. Ikoma doesn’t have that comfort. He knows that he’s changed. Another big difference is Mumei. She’s there to give Ikoma some guidance and, early on, needed protection. She’s far different than her closest analog in Attack on Titan, which is Annie Leonhart. At least based on current appearances, Mumei is fighting to save humans in a way they can understand as salvation. I can’t really say that about Annie, though to be honest, I don’t know what her motivation or goals are. We’re only two episodes in, but the story, characters, and art are thoroughly enjoyable. I can’t wait to see what episode 3 brings.